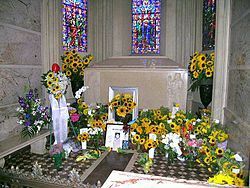 The Gravesite Of Michael Jackson. . Wallpaper and background images in the Mari club. This Mari photo might contain kotak jendela, altar tinggi, and high altar. Behind The Scenes In The Making Of "Blood On The Dancefloor"
"The Magic, The Madness & The Whole Story"
Behind the Scenes In The Making Of "One lebih Chance"
Behind The Scenes In The Making Of "The Wiz"
1991 Biography, "Michael Jackson: The Magic And The Madness"
"Don't Stop 'Til anda Get Enough"
2007 Book, "Conspiracy: Inside The Michael Jackson Case"
Biography, "Michael Jackson: The Magic And The Madness"
2003 Documentary, "Living With Michael Jackson"